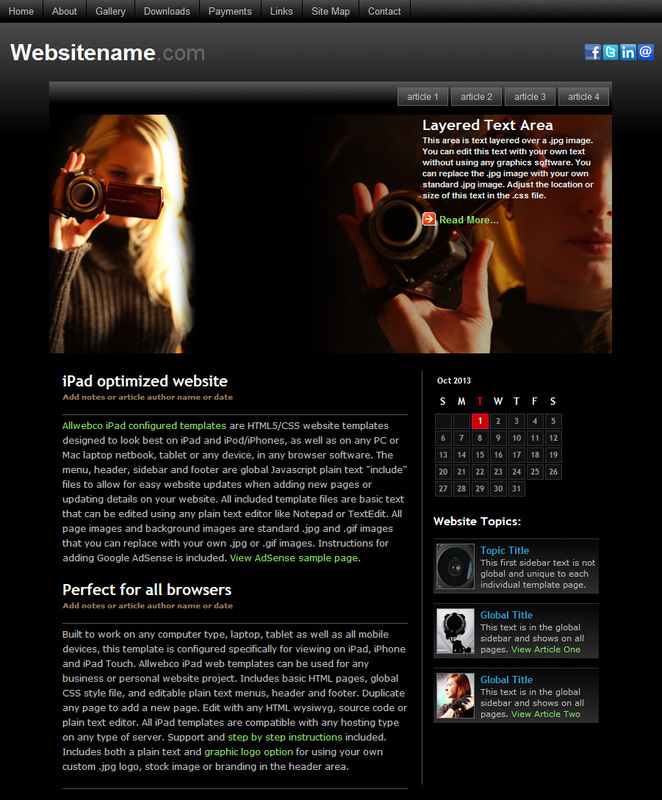 Web design templates configured for tablet and mobile as well as PC and Mac. Includes all source files and stock images. Image theme: Flowers, botanical, greenhouse garden and nature. Color theme: Yellow and green. Setup with 17 pages including web contact form, Paypal payment page, slideshow type image galleries. 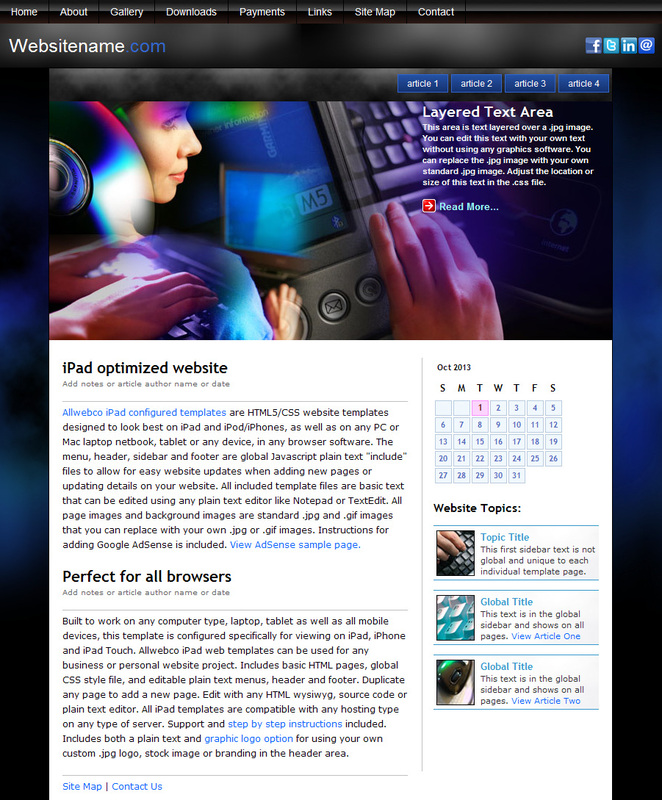 Built to W3C HTML5 and css web standards specifications, all Allwebco tablet and surface website templates are designed for mobile compliance in all popular devices as well as PC and Mac laptops and computers. 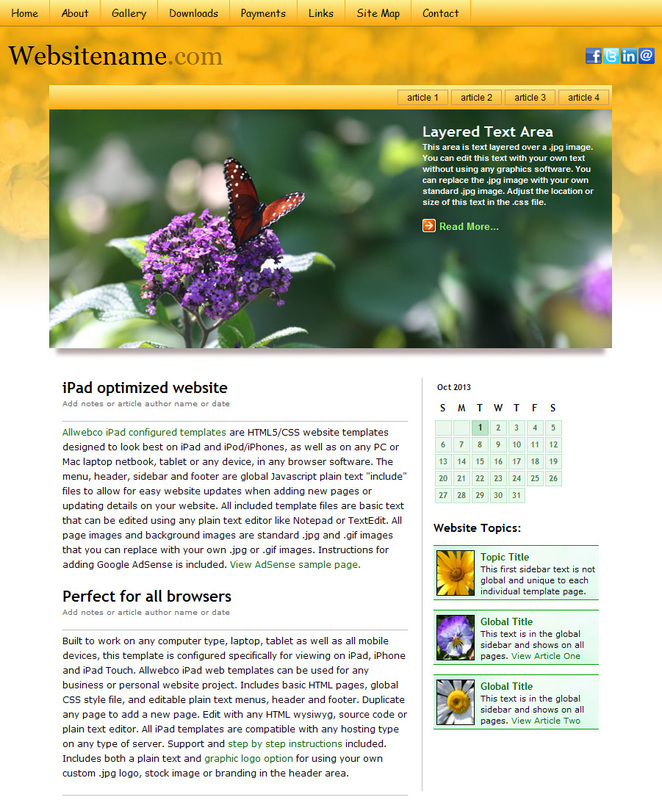 Designs include meta tags in each page for "viewport" with "device-width" and "Cache-Control" content "max-age" to allow a user end updated view of the website. Images are integrated using optimal height and width as well as the file size, for fast loading. 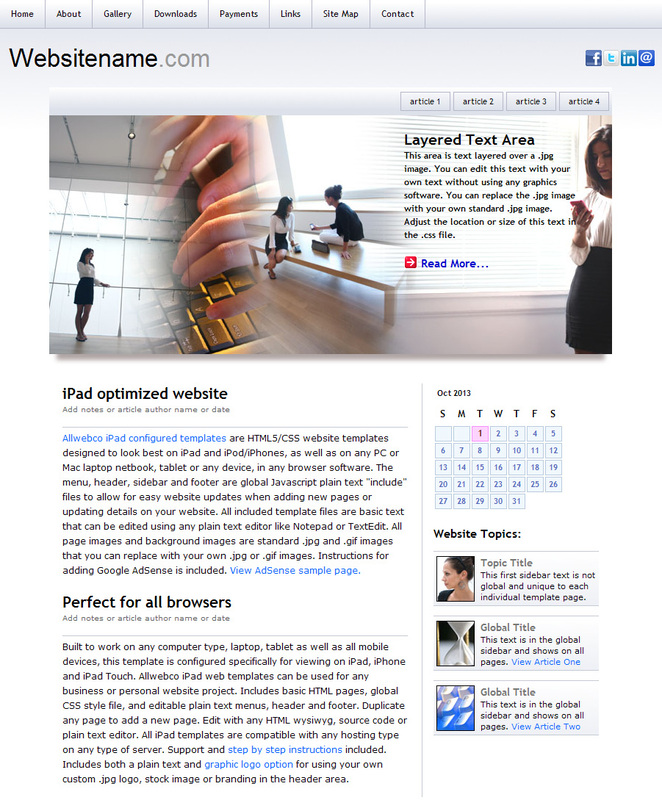 HTML5 web standards are used on all webpages as well as in the global css style file. Colors, layout and other visual features are easily modified using any plain text editor. Designs can be edited using any HTML wysiwyg software or any type of text editing software. Stock photos included. Image theme: Photojournalist, people, professional models and photography equipment. Color theme: Black & gray. 17 webpages are included: Contact form page, image gallery, downloads page for zip, mp3, jpg, video and PDF or any other file type, plus other standard popular page types included. All stock photos included. Image theme: Niagara Falls National Park in New York, Nature and people enjoying nature. Color theme: Blue, cyan and gray. 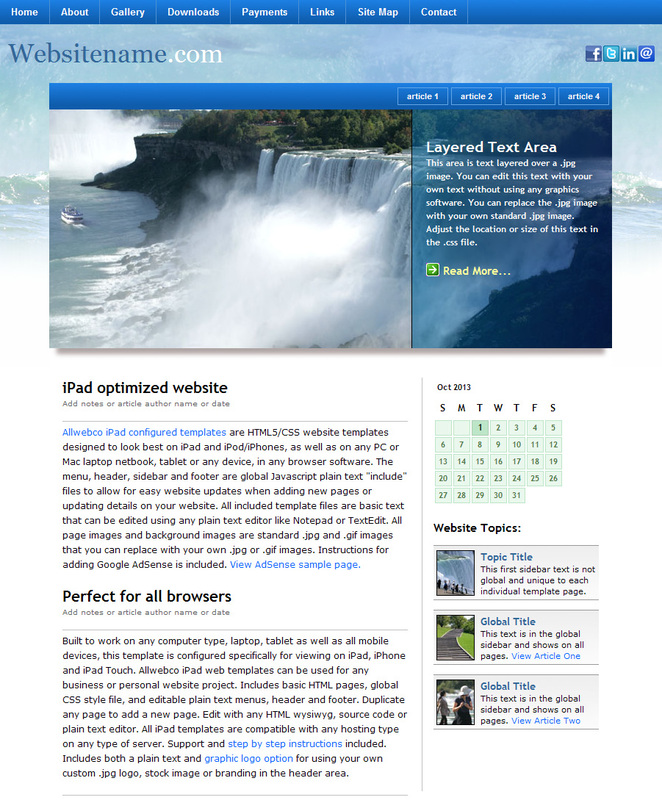 Designed for optimal display on tablet, surface computers, and other mobile devices. Image theme: Computer telecommunications, IT, Internet technology and other tech related. Color theme: Black with other color highlights. Stock image theme: Professionals, communications and people in business. Color theme: White and light gray. Designed for optimal viewing on tablet and surface computers like iPad, Microsoft Surface, iPhone, Android and others.